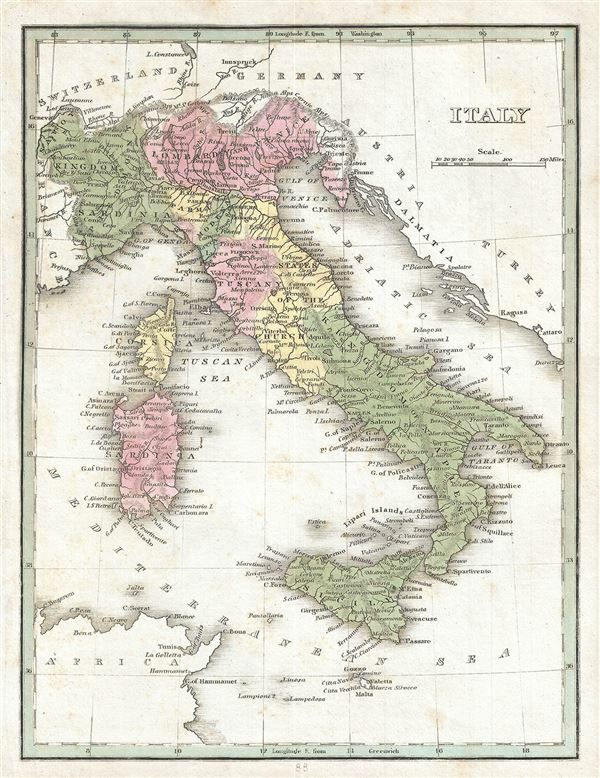 This is an appealing 1835 map of Italy by the important American mapmaker T. G. Bradford. It covers the entire Italian peninsula from the Lake of Geneva to Malta. Towns, rivers, mountains and various other important topographical details are noted. Elevation throughout is rendered by hachure and political and regional territories are color coded. As this map was drawn, revolutionary sentiments favoring the unification of Italy were gaining popularity under Giuseppe Garibaldi, paving the way to Italian solidarity. This period thus witnessed the birth of the 'La Giovine Italia' Italian solidarity movement. In 1830, a series of insurrections throughout Italy lead to the adoption of the Tricolore and nearly established a united Italian state. Unfortunately, in 1831, Pope Gregory XVI invited the Austrian army to help crush the insurrections, postponing the push for Italian solidarity until the Revolutions of 1848. The map was published as plate no. 88 in Thomas G. Bradford's 1835 Comprehensive Atlas Geographical, Historical and Commercial. Bradford's atlas, published in 1835 was an important work on many levels. First, it was one of the first American atlases to follow an encyclopedic format, offering readers extensive geographical and statistical tables to supplement the maps themselves. Second, it was published in Boston and influenced the city's rise as a publishing center later in the 19th century (at the time most publishing in the United States was restricted to New York and Philadelphia). Third, this atlas was the first to contain a separate and specific map showing the Republic of Texas. Fourth and finally, Bradford's atlas in some instances broke the Euro-centric mold regarding atlas production. Among other things, Bradford focused his atlas on the Americas and abandoned the classical decoration common in European atlases in favor of a more informational and inherently American approach.